A group of friends and I went on a photographic scavenger hunt in Alexandria, Virginia, today. 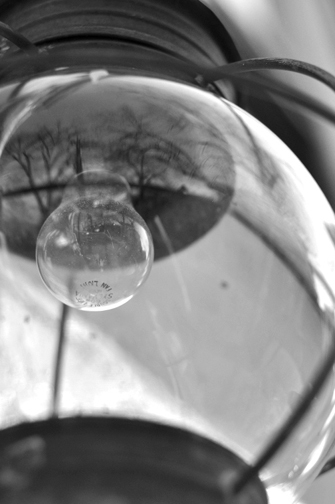 Our assignment was to capture images that relate to selected words, including these: interaction, duo, and circular. Below are the photographs I made to encapsulate these words. 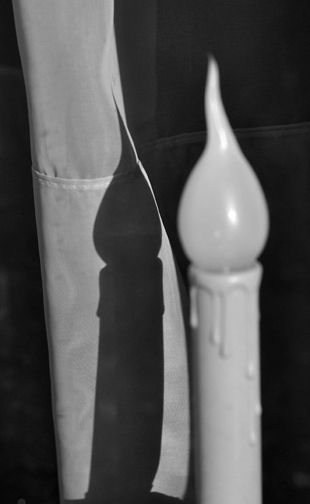 Interestingly, this photo captures the interaction of the candle stick with something that is not explicitly shown in the photo, that is the light falling on the candlestick, which we become aware of because of the shadow it casts. 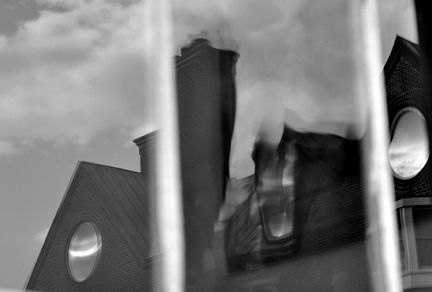 Alexandria has many houses with old, wavy glass, which affects how images are reflected back to the viewer. The reflection of the trees in this image lends an air of mystery. “Caught in the Act” is the name of an upcoming invitational art exhibit at the Northbrook Public Library and Arts Center in Northbrook, Illinois. The purpose of the show is to display artwork that “seeks the moment of the numinous, the captured instant that reveals and questions what is hidden.” My photograph, Boys at Play, reproduced in this post, will be on exhibit in that show. The show will open with a public reception on Friday, October 3, 2008, and will continue through October 31. For more information about the show, you may visit the show’s website by clicking -HERE-. That website will be updated with an exhibition catalog on September 23. I hope to see you at the opening reception. I am preparing several photographs for an upcoming exhibit in Frederick, Maryland. I have been inspired to go beyond the pictures themselves and create works of art that, while centered on the photographs, provide a context for the images as well. 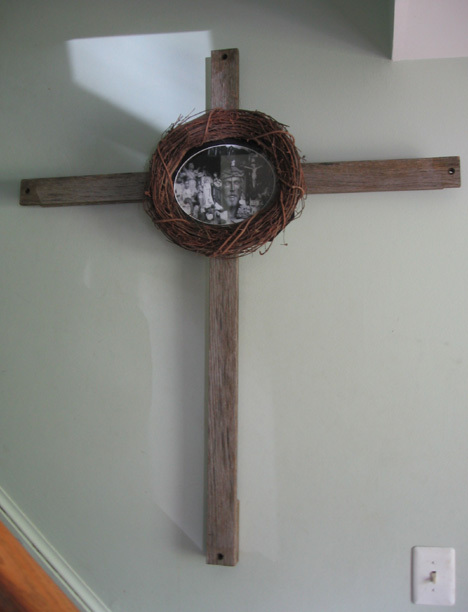 Schism II (shown below) incorporates the photograph, Schism, but includes a handcrafted weathered oak crucifix as a base for the photo, and a wreath of vines (crown of thorns?) 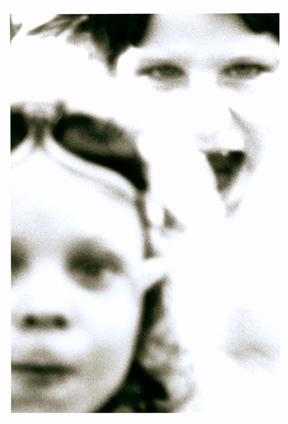 as a frame for the image, adding layers of meaning not available from the photograph standing alone. 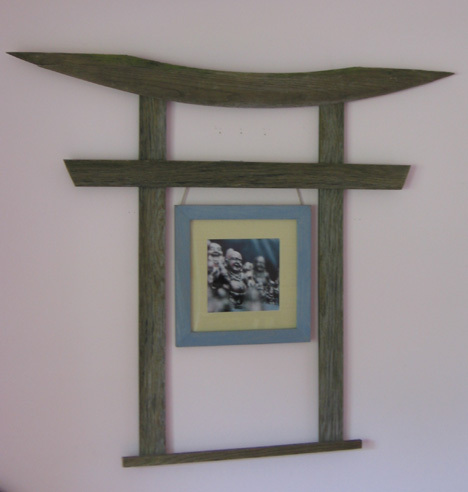 Welcome to Nirvana (shown below) uses the photo of the same name as its basis, but the photo floats within the open space of a Japanese Torii gate, which I constructed using weathered oak, as its context. It is as if the traveler (the small figure in the lower right corner) has just passed through the Torii gate to come face to face with the object of his longing. Also, I used a subtly colorized version of Welcome to Nirvana to create this piece. 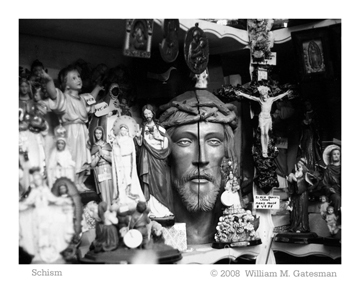 To see a clearer image of the underlying photographs, visit the Focus on Religion gallery at www.wmgphoto.com and click on the thumbnail images. I came across this statue of Jesus’s face, rent asunder, in a shop selling Christian religious iconography in Los Angeles. Schism, the photograph’s title was inspired by the crack in the statue’s face, but the more I looked at the image, the more it occured to me that the other elements of the image convey the sense of schism as well. The right side of the image is dominated by Jesus on the cross. A brother holds a child in his arms, and the child looks lovingly up at the Christ on the Cross. The left side of the rent image of Christ is a different story altogether. On the left, higher and larger than the crucifix is a statue of a person whose arms echo the arms of Jesus on the cross, but this person’s gaze is directed not on the Lord himself, but rather on the images above, highly iconographic images of the Virgin Mary holding the baby Jesus. Also on the left are various statues of Mary in the different forms in which she has been depicted, including a dark-skinned virgin in the background. Kneeling on the floor in the left foreground are two children in prayerful pose looking up. Are they looking to the statue of Jesus before them, or are they instead praying to the various images of Mary, the face of one being surrounded by a halo’s glow, and both of which seem to have been placed just ahead of the Jesus statue, and thus, closer to the praying children. So, while the crack in the face of Jesus brought to my mind the word “schism”, the rest of the composition speaks volumes about what that word might mean in the context suggested by the religious icons on display. 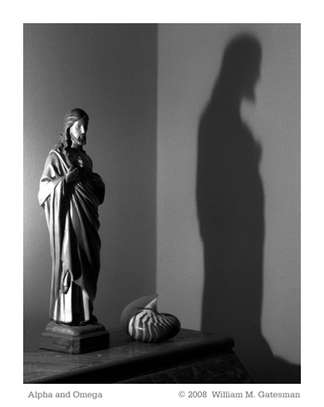 Alpha and Omega, the image in this post, is my latest addition to the Focus on Religion gallery at my online Photo Gallery. I invite you to visit the photo gallery and look at the other images as well. 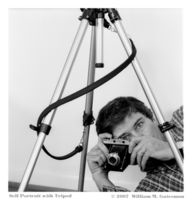 This website features William M. Gatesman's photographs and musings about photography and the creative process. This site is affiliated with Bill's online Photo Gallery, www.wmgphoto.com. You may visit the Gallery by clicking on the words "Photo Gallery" below. This blog, featuring my musings about photography and the creative process, is associated with my Gatesman Photo Gallery, the link for which is below. Click -Here- to send us an email if you have any questions or comments or if you would like to obtain a photographic print of any of the pictures.